Wondering why there’s looooong line of guests waiting to leave the ceremony or enter the reception? Yup, you’ve just encountered your first receiving line. Don’t panic. It’s easy to navigate, and we’re here to answer all your questions. What exactly is a receiving line? 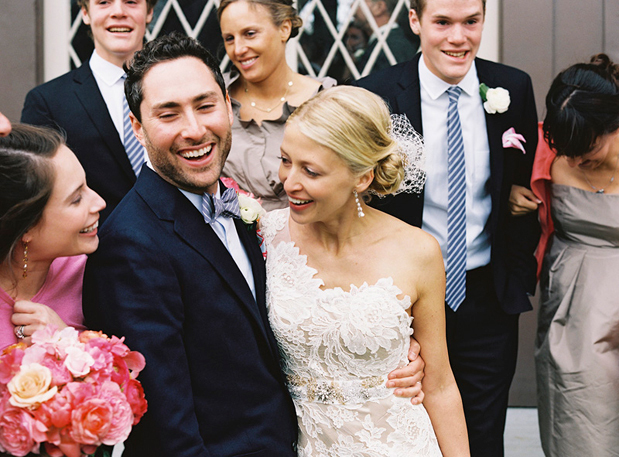 A receiving line is simply a way for the newlyweds and the hosts (usually their parents) to greet their guests. Guests line up to take their turn saying hello to the VIPs. Who’s in the receiving line? Traditionally, you’ll find the newlyweds and their parents in the receiving line. But these days, couples are customizing who’s in the line. You might find grandparents or other family members. They might choose to include their wedding party, too. – Say hello! This is your chance to congratulate the new couple and their families. They’ll be busy all night, so you might not have another chance. – Introduce yourself (and your date). If you’ve never met the newlyweds’ parents or other family members, introduce yourself and your date and explain how you know the couple. – Pay a compliment. Something simple and short like, “That was such a beautiful ceremony” will be much appreciated. That’s it! Seriously—these lines get long, and you don’t want to be the person holding it up. This is not the time for a heart-to-heart! After the receiving line, the party (or at least the cocktail hour) begins. Grab yourself a snack and a drink from the bar, and mix and mingle. Have fun!